Instructions: Carefully read the comic and respond to the question that follows. Based on this comic, write a reply describing two effects of the Neolithic Revolution. After the Neolithic revolution man for the first time in history really started to shape the land around him, by agriculture, later on this lead to a greater number of human beings, because more people could be fed by crops than by hunting. Overpopulation. Another effect in the long run are all kinds of environmental problems. Like organizing cities, government ect. Since the Neolithic Revolution was an agricultural revolution switching from hunting and gathering to agriculture these effects spread. One the basic effects were the domestication of plants and animals. The people no longer had to hunt and gather their food they could grow food and eat the domesticated animals. Another effect is that birthrates increased With food now grown in large amounts families expanded the number of children. 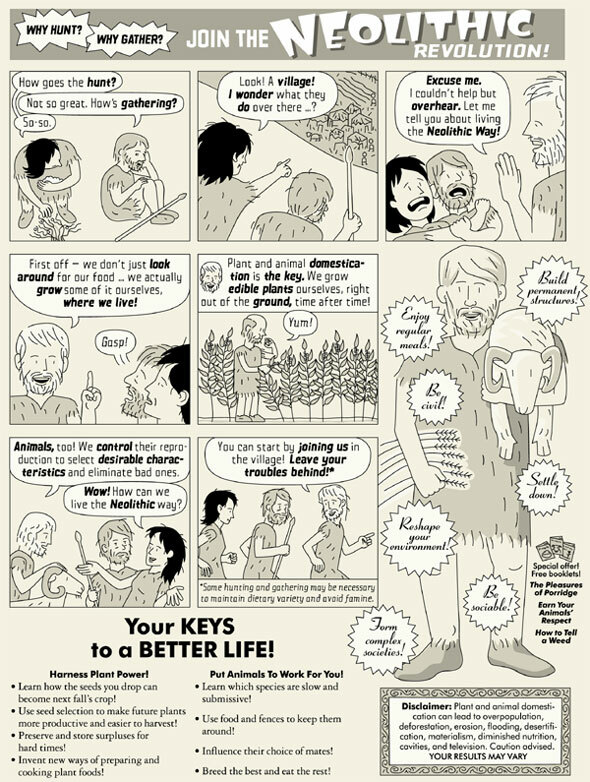 I think that the comic greatly explained the beginning of the neolithic age by saying animal domestication and growing their own food. -I think that growing crops was a huge effect, this way the people could do other work while they have their food sitting out there, being ready to be cut. -Another big effect in the Neolithic Revolution was the people's livings. They had villages and they could also herd animals so that they could have food supplies. Since they all lived in villages they could work together and make babies to increase the population. The two effects of the Neolithic Revolution are population growth and domestication of plants and animals. When people started forming small villages instead of hunting and gathering they began growing crops and herding animals. It was enough for them to feed a lot of people. This caused the huge population growth.Population growth is another effect of the Neolithic Revolution. 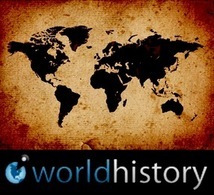 The Neolithic Revolution occurred at around 10,000 B.C. Before this occurred, there were many different types of “humans” that lived, all the way back to 4,000,000 B.C. the Neolithic effect affected the life of all human beings that lived at that time. One effect that occurred to the humans was the importance of agriculture. The five most important changes that occurred due to the agricultural revolution were: more free time, a bigger economic growth, food surplus, domestication of animals, and people stopped being nomadic. So, one major effect of the Neolithic Revolution was the effect of farming. Due to farming, the global temperatures went up and world populations increased. People had food all the time because they didn’t have to walk in search of food and also, they had more than what they needed, so they could keep some in store. The second major effect can be considered as how being nomadic stopped being a problem. Since the people started farming, they didn’t need to migrate in search of their food anymore and they had animals to help them with the hard jobs. They started farming and began to ‘listen’ to how the environment was calling. They started planting crops, having more kids, a safe home, a “job”, and a lot of food! They could now built protection for their families and weren’t as scared to be in a place (weren’t scared to be eaten by animals). This Comic explains the main points of the Neolithic Revolution. People switched from hunting and gathering to planting crops (agriculture). This helped people stay in one place, and the human population grew. In the Neolithic Revolution people also started to domesticate animals. In this comic it shows all of this very well. The neolithic revolution was when humans changed from hunting and gathering, to settled agriculture societies. In this major change, food supplies became more reliable as people domesticated animals and planted seeds. Social and political systems developed in the settled societies. Two effects on the Neolithic Revolution is that the hunters from before used to hunt for food, which they were nomads. Than those persons started becoming intelligent, which made them to stop being nomadic and build their own home. There you can grow your crops and domesticate animals to have the meat or fur. The Neolithic Revolution was a time where homo sapiens sapiens discovered agriculture. Two effects of the Neolithic Revolution was the population increase. People had enough food and time to do more things with their life, so that was a way for the population to increase. Another effect was that there were city-states and there was also a food surplus. With the domestication of animals, people grew their food faster and it was enough food to last for weeks. The first effect of the neolithic revolution is having theier own crops grown at theier own hoses. And they could gather up all of the vegetables, fruits etc. that they want and eat it and if they have extra they will save some. The second effect was the domestication of the animals. they din't have to go hunting for animals so they could eat. They will have them for the farming because they neede strong animals and also they neede meat so if they wanted some meat they will only have to kill the animal for food. Beacuse of the neolithic revolution the homo sapiens sapies were becoming samrter and finding new things asnd they could have a setteld home.